A small island off the coast of Panama designed as an eco-tourism destination by Design Workshop for a private client, Isla Palenque is an intriguing project. Of particular interest is the agriculture program, which goes beyond the kitchen garden concept by proposing to grow the building materials for development in 'forest gardens'. "The team recognized the constraint and expenses of importing food and building materials to the island and developed an agrotourism program that proposes three mitigating actions: an organic production orchard, an edible forest garden and the scattered plantings of fruit trees. The program was adapted to the local environment under the guidance of local farmers. Residents will grow much of their own produce in community gardens. Deforested lands are utilized for the growth of building materials, including palm leaves for thatch and bamboo for furnishings. 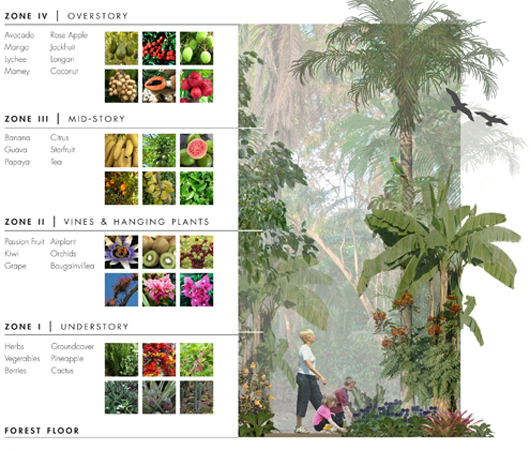 Orchid and bromeliad specialty gardens offer public interest, planned in appropriate microclimates. 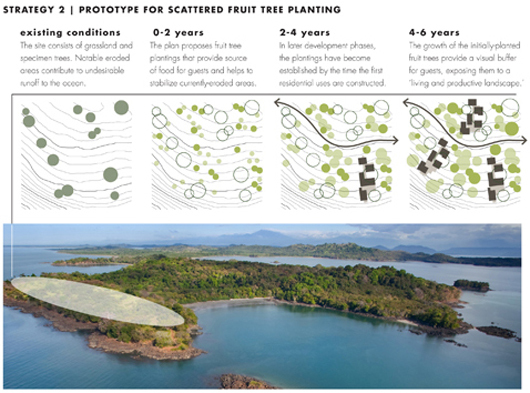 Along the southern hammerhead where historic livestock activities once occurred, fruit trees will be planted and allowed to mature in order to screen future residential casitas. 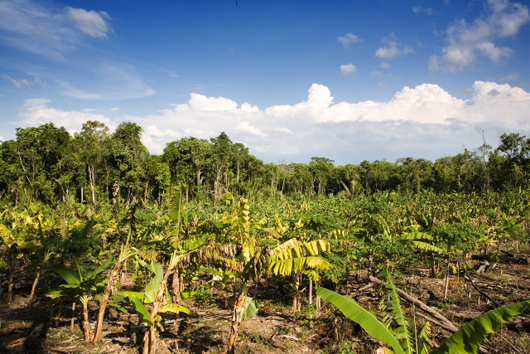 Until then, tree roots help stabilize the deforested land and provide produce for residents." Phasing the landscape to anticipate, and provide for, future development is an important land-based sustainability strategy. It's hard to tell if the forest gardens have been scaled appropriately for the developments needs, and it would be interesting to see a construction materials need analysis, along with a forecast of food requirements for the residents and guests. Still, the project demonstrates how landscape can be understood as an active player in the making of a place, rather than an ornament after the fact. It also engages the tension between landscapes of leisure and labor in unexpected ways. The idea of the forest garden on Isla Palenque reminded me of the Maya Forest Garden, a collaborative effort between researchers at UC Santa Barbara and indigenous farmers of El Pilar Archaeological Reserve on the border of Belize and Guatemala. On this site farmers work the land in the centuries-old 'Forest Garden' or milpa practice of the Mayan people. Researchers work with the farmers to understand how this agricultural practice might offer "a paradigm for future conservation of the forest and sustainable agriculture." In the traditional milpa cycle, the first stage is clearing of a piece of forest, and planting of maize, beans and squash in the full sun. The wood harvested in this phase is used for construction materials or firewood. In the second stage, fruit trees are planted, including banana, papaya and avocados, and begin to produce within one to five years. By the third stage, the fruit trees are mature enough to block the sun, reducing the viability of the maize, beans, squash and other crops previously grown. At this point, hardwood trees are planted. The final stage is the return of the forest garden to forest - the hardwoods trees shade out the fruit trees, and the farmer will have moved on to a new plot. The cycle takes approximately two decades. As landscape architects know all too well, people often perceive landscape as pre-existing entities, recognizing neither the design effort nor the need for continued maintenance. This attitude is most obvious when it comes to large natural landscapes, like the rainforest. The Mayan farmers see things differently. Alfonso Tzul, a modern Maya farmer and retired agricultural extension officer, describes how forest gardens came to be: "God created plants and animals and the world around us. Trees grew in the forest, seeds spread, birds sang, and animals flourished. All was already there. Man came along and preferred this plant, favored that seed, enjoyed those birds, and supported those animals, creating and using the forest as a garden to sustain those plants and animals. The job of the forest gardener is to manage the forest by adding, removing and nurturing plants, to make sure that certain species grow where they will be most viable." The cyclical, temporary method of the milpa farmer is an intriguing approach to consider in landscape architecure. It's reminiscent of the process-based design behind Downsview Park and Fresh Kills Landfill (in which a process is initiated by the desiger, and a long-term landscape develps from the intial framework). Yet it differs in the suggestion of a continuing relationship with the land, an invested interest in how each stage of the cycle unfolds. The Forest Garden is a precedent straddling agriculture and design, a temporary yet ongoing shaping of a landscape over time for specific desired outcomes.